↑ "Conquest in the Americas". MSN Encarta. 28 October 2009. मूल से 28 October 2009 को पुरालेखित. अभिगमन तिथि 14 July 2013. 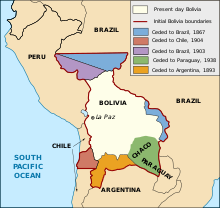 ↑ "Bolivia – Ethnic Groups". Countrystudies.us. अभिगमन तिथि 30 August 2010. ↑ McGurn Centellas, Katherine (June 2008). 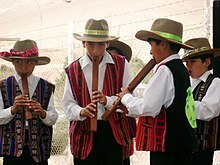 For Love of Land and Laboratory: Nation-building and Bioscience in Bolivia. Chicago. आई॰ऍस॰बी॰ऍन॰ 9780549565697. ↑ Grant, Will (8 October 2007). "CIA man recounts Che Guevara's death". BBC News. अभिगमन तिथि 2 January 2010. ↑ "Statements by Ernesto "Che" Guevara Prior to His Execution in Bolivia". Foreign Relations of the United States, Volume XXXI, South and Central America; Mexico. United States Department of State. 13 October 1967. XXXI: 172. मूल से 6 February 2009 को पुरालेखित. 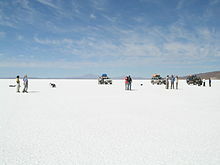 ↑ "Anti-Morales protests hit Bolivia". BBC News. 10 September 2008. अभिगमन तिथि 30 August 2010. बोलिविया: देश का अध्ययन (यू.एस. लाइब्रेरी ऑफ कांग्रेस).